One day in January 2003, my friend and colleague Ali Reza Eshraghi republished an old American cartoon in the Hayat No newspaper -- a cartoon the Special Court for the Clergy deemed insulting to the Islamic Republic's founding cleric Ayatollah Khomeini because they thought its character looked like him. The cartoon was actually an American satire of Franklin Roosevelt, drawn in the 1930s long before Iran was even an Islamic Republic, but that made no difference. Ali Reza was sent to Evin Prison where he spent two months behind bars; the Hayat No was banned and dozens of journalists lost their jobs. Three years earlier, in January 2000, another cartoonist friend of mine, Nikahang Kowsar, drew a cartoon depicting a crocodile whose name rhymed with Mesbah Yazdi, an extremist cleric in Qom. The cartoon angered the powerful cleric's supporters to the point where they took to the streets. Mesbah supporters gathered for three days in Qom and other cities and did not end their protest until Nikahang was arrested and the Supreme Leader Ali Khamenei issued a statement ordering the end of the gatherings. Ministry of Culture authorities, Iran's security apparatus, and extremist conservative media could not tolerate even the vague similarity of cartoon characters to the country's officials, much less an attempt to actively caricature them. Both of my friends received death threats, though thankfully both escaped that fate. For me, these two incidents illuminated the power of political cartoons: the depth of their penetration, the breadth of their reach, and their capacity to cause a cartoonist or editor to face the prospect of death. Ali Reza and Nikahang were not the only ones persecuted for cartoons: prominent Iranian cartoonists Ali Divandari, Hassan Karimzadeh, Hadi Heidari, and brothers Mana and Touka Neyestani also faced political harassment for their art. Following the government's steady imposition of widespread limitations on free expression over the last decade, apprehension about cartoons has been running high and the government's tolerance has all but disappeared. Just last May, a young cartoonist, Mahmoud Shokrayeh, was sentenced to 25 lashes when he drew a cartoon about a Member of Parliament, Ahmad Lotfi Ashtiani, who then filed a lawsuit against him. The power of the cartoonist lies in his or her ability to take the most complex social, political, and cultural subjects and illustrate them in such a concise and powerful way that thereafter the cartoon and its message are indelibly tied to the topic in the mind of the public. Cartoons are a strong medium; they can transfer a message instantly, reaching beyond linguistic and cultural barriers to illustrate a country's current state of affairs both for its citizens and for the world. It is because of this power that the consequences are so harsh for cartoonists who refuse to ignore the daily struggles of their society. This is especially the case when a cartoon deals with deeply human issues, such as individual, social, and political freedoms, or when it somehow challenges those in power. In recent years, the inevitable difficulties of working in such an environment of intimidation, threats, and interrupted artistic creation have forced some Iranian cartoonists, much like Iranian journalists and civil society activists, to leave Iran for other countries. Some who still work inside Iran, in order to remain out of prison, have had to either communicate through a language of multi-layered metaphors or altogether give up drawing cartoons that remotely challenge the rulers' narrative about different issues in Iranian society. Even so, many still create brilliant works that reflect the bitter realities of Iranian society. Many cartoonists have fled Iran's oppressive atmosphere. Both Nikahang and Ali Reza left the country after the death threats ebbed. 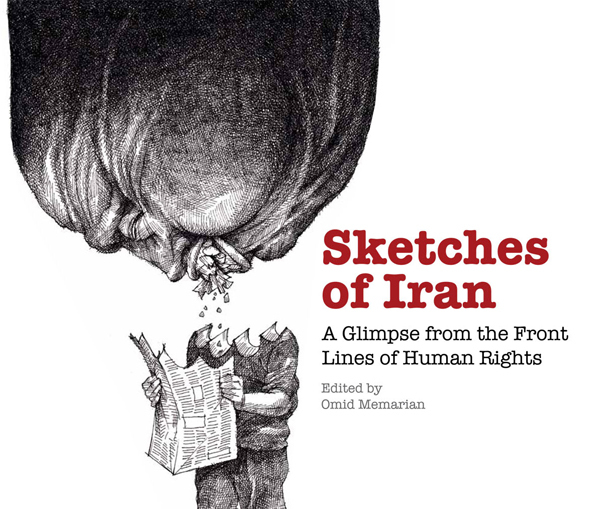 Over the last decade many others, including Touka and Mana Neyestani and Afshin Sabouki, whose works are represented in this book, have left Iran as well. I was tired of my life of crime.... I was teaching drawing to several boys and girls, which wasn't allowed. I used live models in my sketches, which wasn't allowed. In my classes I said things that weren't allowed. Instead of watching our own TV series, I watched channels that weren't allowed. I listened to music that wasn't allowed. On my computer, I had lots of photographs of delightful and beautiful people that I wasn't allowed to have. I saw films and kept some at home that weren't allowed. Sometimes I would secretly visit Facebook, which wasn't allowed. In parties, I socialized with strangers I wasn't allowed to know. I laughed out loud everywhere, which wasn't allowed. There were times when I was happy when I was supposed to be sad, which wasn't allowed. I liked eating some foods that weren't allowed. I preferred drinking Pepsi to doogh [a yogurt drink], which wasn't allowed. None of the books and authors I liked were allowed. I had worked in magazines and newspapers that were not allowed. I thought about things that weren't allowed. I had wishes that weren't allowed, and ... it's true, I was never punished for all this criminal conduct, but there were no guarantees that I wouldn't be questioned someday for every single one of them. Worse yet, the very thought of always being involved in a crime and escaping the law disturbed me. The cartoonists whose illustrations appear in this collection delve into issues that affect many lives in Iran every day. Accompanying each cartoon is an essay by an individual offering his or her personal experience with the subjects illustrated. The contributing writers in this book include journalists, civil society activists, and academics, most of whom have themselves faced violations of their rights and personal, social, and political liberties. Additionally, some family members of political prisoners have sent personal notes for this book or have taken part in interviews that we then put into essay form. In these essays, they share personal perspectives beyond the legal issues related to their kin, who are now political prisoners. These families share their sorrows and joys, their fears and hopes with all of us. These short, intimate, and at times deeply personal essays take us through situations we may have never thought about and introduce us to individuals whose life choices inspire us all. The wide variety of experiences sheds light on the pain and suffering so many Iranians endure every day. These stories barely scratch the surface of the reality of Iran today, of people enduring wanton violations of their basic human rights, and many dedicating their lives to fighting for them. This book offers only a snapshot of the daily struggles of Iranian society, a glimpse from the front lines of human rights. Republished with permission from the International Campaign for Human Rights in Iran.